Pujya Gurudev always used to say, “children are not vessels to be filled, but lamps to be lit.” Because of his Vision, Chinmaya Mission developed Balavihar programs in order to educate children on the fundamentals of Sanatana Dharma, and how to apply these principles to their daily lives. As children graduate Balavihar, they are encouraged to continue their spiritual practice and education by joining Chinmaya Yuva Kendra (CHYK). 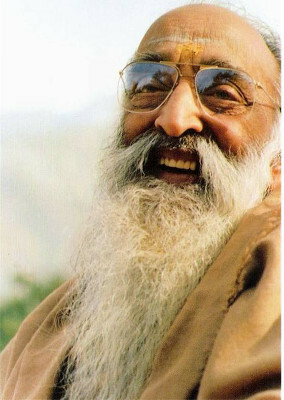 CHYK is the youth wing of Chinmaya Mission, where young adults are taught to channel their dynamic spirit and energy towards selfless service, devotion to the Lord, and study of spiritual texts. CHYK West is honored to present to you information regarding the 2019 Youth Empowerment Program (YEP). 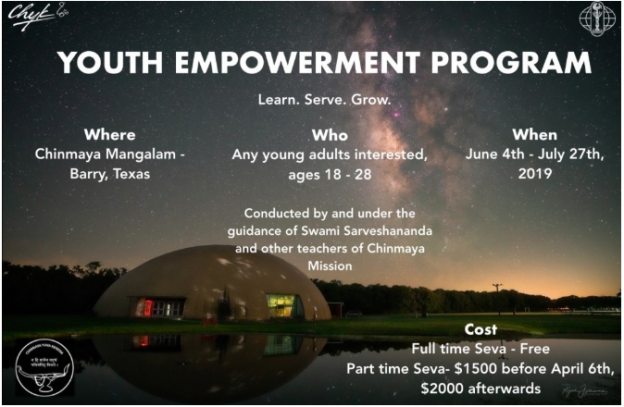 YEP is a Chinmaya Mission initiative through which young adults have the opportunity to live in an ashram setting for two months, where they will exposed to the realm of Vedanta and its practical messages for a fulfilling life . Through the grace and blessings of Pujya Gurudev, Pujya Guruji, and Pujya Swami Swaroopanandaji, the 6th batch of YEP America will be conducted at Chinmaya Mangalam in Barry, Texas, under the loving guidance of Swami Sarveshanandaji. During the program, students will have the opportunity to explore various Vedantic scriptures in depth, such as introductory texts written by Bhagavan Adi Shankaracharyaji, the Bhavagad Gita, and the Upanishads, learning directly from Swamiji and other teachers of Chinmaya Mission. YEP will also include activities and workshops in order to facilitate inner growth, teach essential life skills, build moral values, and inspire the participants to serve society with an attitude of humility and compassion. Students leave YEP with heightened self-confidence and mindfulness, a strong support system of friends and mentors, and a commitment to the pursuit of true happiness and knowledge. Registration for YEP 2019 has officially opened— The program will be conducted from June 4 – July 27, 2019. The early bird deadline to register is April 6. We encourage you to pass on this information to any young adults who would be good candidates for this program. YEP is not limited to individuals who have participated in Balavihar – all young adults aged 18-28 who are interested in studying Vedanta and benefiting from this program are encouraged to apply. Any questions can be emailed to [email protected]. This entry was posted in Archive on March 19, 2019 by admin.